Carbon cartridges are one of the most effective and widely used technology in the point of use water treatment industry today. They are used either as standalone treatment methods or in a system with other cartridge types. Carbon is a very versatile and highly effective water treatment medium. It has immense surface area. Approximately half a kilogram of carbon contains a surface area of over 50 hectares (0.5 square kilometres). It is the best-known treatment for organic chemicals, volatile organic chemicals, pesticides, herbicides, chlorine and its by-products. It is also an unchallenged taste-and-odour improver. 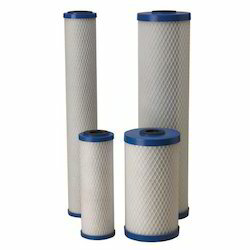 It also provides very high quality particulate filtration, in some cases down into the submicron level.